Shawn Torrez, Anthony Cordova, and Christina Torrez were all arrested on felony warrants. 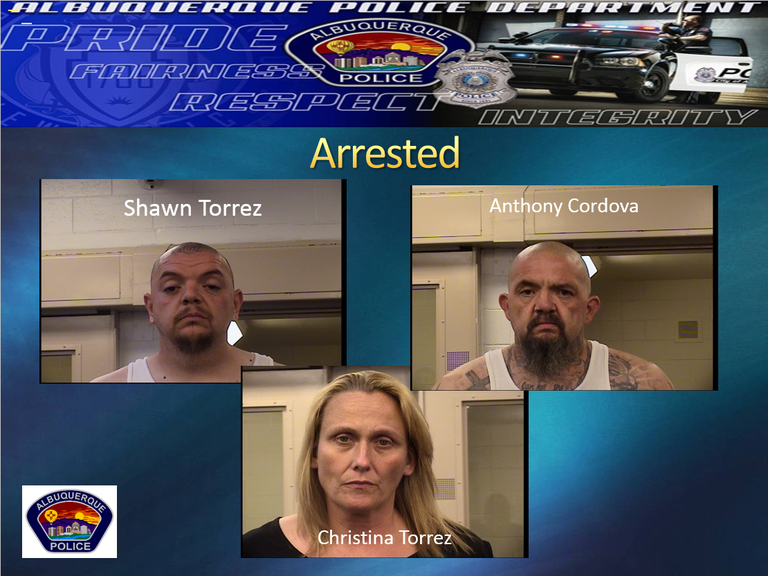 Shawn Torrez,39, Anthony Cordova,52, and Christina Torrez,42, were all arrested on felony warrants obtained during the investigation of a fraud ring. 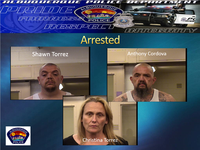 On 05-16-2017 at about 5:30 a.m., the Albuquerque Police Department Organized Crime Unit (OCU) and SWAT Unit arrived to 6217 St Josephs Ave NW in reference to several wanted subjects known to be at this residence who were in connection with this ring. Detectives have been working this investigation for several weeks which involved identity theft, mail theft, and check manufacturing that affected both businesses and citizens of Albuquerque. During this investigation it was discovered these subjects were manufacturing fake documents, stealing Albuquerque citizens identities and forging documents. These subjects were observed using these documents for personal financial gain at the expense of the innocent victims. Detectives were able to obtain arrest warrants for the arrest of the three suspects for several crimes. SWAT was called to assist due to information detectives were given that these suspects had a violent nature and were armed. SWAT officers arrived along with OCU detectives and observed the wanted subjects outside the residence. Officers were able to get Anthony Cordova (AKA Jose Torrez) and Christina Torrez immediately into custody but Shawn Torrez ignored officers commands and went back into the residence. SWAT and the Crisis Negotiations Team (CNT) attempted to make contact with Shawn and anyone else inside the residence. The Bomb Squads robot was sent to the front door of the residence in an effort to speak with Shawn utilizing the robot. Shawn opened the front door and opened fire at the robot and toward officers. No officers or citizens were struck by the gun fire and Shawn went back inside the residence. Officers continued negotiations with Shawn and eventually several other adults along with three small children exited the residence but Shawn remained inside. They were taken to a safe area and they advised officers that Shawn was heavily armed and stated that he was not going back to jail. Officers continued negotiations with Shawn and after 3 hours of Shawn not cooperating with police nor listening to commands were forced to introduce a gas vapor inside the home. Shortly after this, Shawn exited the residence and was taken into custody without incident. Shawn Torrez was booked and charged with felony Criminal Damage to property, Aggravated Assault on a Police Officer with a Deadly Weapon, Child Abuse, Felon in Possession of a firearm, Fraud, Identity Theft, Forgery and Unlawful Alter/Forge of a Drivers License. The handgun Shawn used to fire at officers was located and seized. Anthony Cordova (AKA Jose Torrez) was booked and charged with Unlawful Alter/Forge of a Drivers License. Cordova was found to have a stolen postal workers uniform and identification. He used the stolen identification to create his own postal identification using false information. Christina Torrez was booked and charged with Forgery, Identity Theft, and Fraud. Christina had over a dozen NM drivers licenses with her picture and another persons information. The Bomb robot sustained damage to its casing and a communications antenna. The cost of the repairs is estimated to be at least $1,000. The OCU detectives did an outstanding job on this investigation and are working with federal partners on other possible charges. The SWAT and CNT teams did an excellent job taking these suspects into custody after a violent encounter with Shawn Torrez. A search warrant was executed and three firearms, a stolen vehicle, cocaine and methamphetamines were located and seized from inside the residence. We want to thank the community for their patience and cooperation during this time.